The Portland Winterhawks (2-0-0-0) capped a great opening weekend as they earned a 7-3 win over the Tri-City Americans (1-1-0-0) Sunday at the Moda Center. Portland is 2-0 after its first two games with matching 7-3 wins, and their 14 goals lead the WHL. The Hawks started strong with lots of early pressure, and it paid off at 5:06 when defenseman Henri Jokiharju scored the first goal of his WHL career for a 1-0 lead. Portland extended the lead on a power play at 12:55 when Keoni Texeira scored on an end-to-end rush to make it 2-0, followed just 29 seconds later by Skyler McKenzie going hard to the net and redirecting a pass from Ty Kolle past Americans netminder Beck Warm to extend the lead to 3-0. It remained a three-goal margin until 8:14 of the second, when the Americans’ Michael Rasmussen scored on a power play to make it 3-1, followed just under three minutes later by a goal from Kyle Olson as Tri-Cities cut Portland’s lead to 3-2. The Hawks regained a multi-goal advantage at 14:10 when defenseman Brendan De Jong rushed the net and converted a rebound for a 4-2 Portland lead they took into the third. It was De Jong’s second goal in as many games, already tying his career-high. 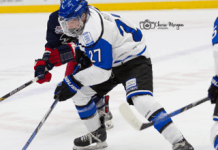 Early in the third McKenzie notched his second of the game when he pounced on a rebound and pounded it past Warm for a 5-2 lead at the 3:28 mark. Tyler Sandhu scored at 5:39 to bring Tri-Cities back within two at 5-3, but once again the Hawks went ahead by three when Evan Weinger fed a great pass to Ryan Hughes in the slot, as he banged it in for a 6-3 lead with seven minutes to play. Weinger added a late empty net goal as the Hawks finished with a 7-3 win. Cole Kehler earned the win in net in his first appearance with the Hawks, stopping 26 of 29 shots. Warm allowed six goals on 36 Portland shots, with the Hawks adding one into an empty net. 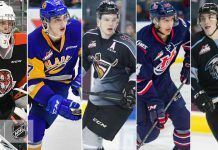 Several Portland players finished with two points apiece: McKenzie, Weinger, Jokiharju, Hughes, Ty Kolle and Cody Glass. Portland was 1-2 on the power play and 2-3 on the penalty kill. The Hawks’ next game will be Friday when they host the Everett Silvertips at Veterans Memorial Coliseum at 7 p.m. in a game where the team will be unveiling the arena’s new videoboard.